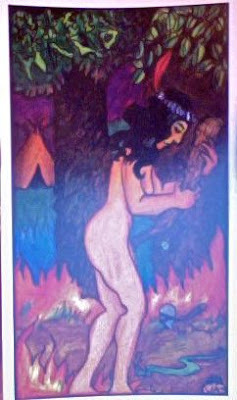 Weekend Reading: Queen of Wands from the 1969 Tarot. The book for this deck says the Queen of Wands is a little backwards in the world. She puts the fire away for the night. So the message for this weekend is to follow your own muse. Dance to the beat of your own drum. And if that means eating dessert first, well then so be it. Most of the rules we live by are random anyway. As long as nobody's harmed, why hold back? It's YOUR weekend. Claim it. Ha ha, I'm thinking you've been in need of your weekends of late, as all the weekend posts seem to be about enjoying yourself and taking time for yourself, or following your own bliss. Which sounds pretty good to me, too :D Have a great one!